One state in particular is an embarrassingly poor performer. Last year, the Modi administration was criticized for stalling on the release of a report that included some embarrassing statistics about the prime minister’s home state of Gujarat. State-level figures in the report, which was jointly issued by UNICEF and India’s Ministry of Women and Child Development, were withheld ostensibly over the administration’s concerns about data accuracy – concerns not shared by UNICEF. It was later revealed that Modi’s home state of Gujarat was among the worst performers in addressing malnutrition, as measured by the percentage of underweight children. In 2012, Modi explained Gujarat’s poor performance by saying “If a mother tells her daughter to have milk, they’ll have a fight. She’ll tell her mother, ‘I won’t drink milk, I’ll get fat’. They have money but she’s beauty-conscious, she’s not health-conscious.” Diverting attention away from the role of government in public health – and towards speculative anecdotes about culture – does little to serve India’s vulnerable citizens. Political wrangling is now swirling around India’s National Food Security Act (NFSA), which establishes legal entitlements to subsidized food. While politicians bicker, India’s children are suffering. 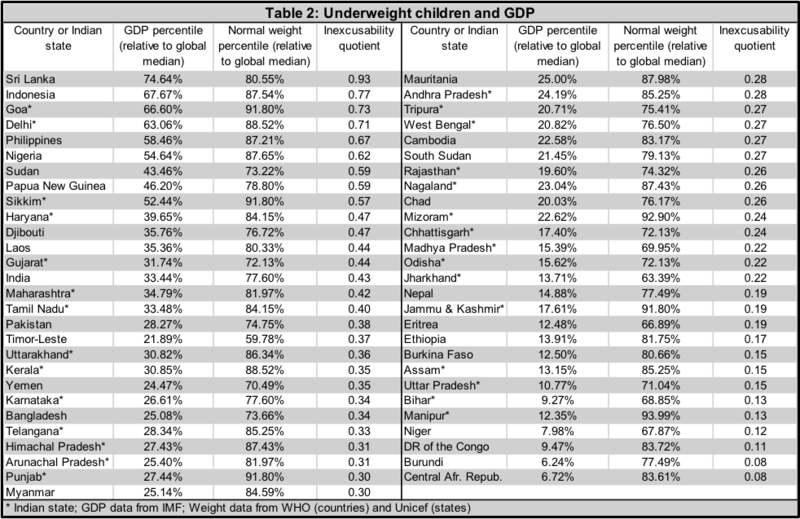 In one measure of malnutrition – underweight children – India performs dismally by international standards (Table 1). Nearly 30 percent of India’s children (under 5 years old) are underweight. By comparison, India’s neighbors are performing better: China (3.4 percent), Bhutan (12.8), and even Sri Lanka (26.3 percent). Further, India has seven states where more than 33 percent of children are underweight: Jharkhand, Bihar, Madhya Pradesh, Uttar Pradesh, Gujarat, Chhattisgarh, and Odisha. As an economic beacon with the 7th highest GDP per capita among India’s 29 states, Gujarat holds embarrassing company with many of the world’s underdeveloped countries on measures of malnutrition. According to World Health Organization (WHO) statistics, only four countries have a higher incidence of underweight children than Gujarat’s 34 percent: Timor-Leste (45 percent), Eritrea (39 percent), Niger (38 percent), and Yemen (35 percent). Among the five states with a higher percentage of underweight children, each has a GDP per capita less than half that of Gujarat. This statistic is so-named because it implies that higher-income countries or states have fewer excuses for child malnourishment. As such, the statistic enables a comparison of how countries and states perform relative to their income levels; it shows “who does more with less.” Table 2 combines statistics for India’s states with those of countries to illustrate the depth of the problem. The analysis excludes countries for which the most recent data precedes 2010: Madagascar (2004), Afghanistan (2004), Mali (2006), and Somalia (2009). Table 2 reveals which countries do less to address malnourishment given their income levels (e.g. Sri Lanka, Indonesia, Philippines, and Nigeria), and which do more (a number of African countries and Nepal). Indian states making comparatively less use of their wealth to address malnourishment include Goa, Delhi, Sikkim, Haryana, and Gujarat. Those doing more include Manipur, Bihar, Uttar Pradesh, and Assam. When overlaying malnourishment data onto state-level measures of human development, there is a discernible correlation; those with lower HDI (Human Development Index) scores predictably have lower levels of nutrition. 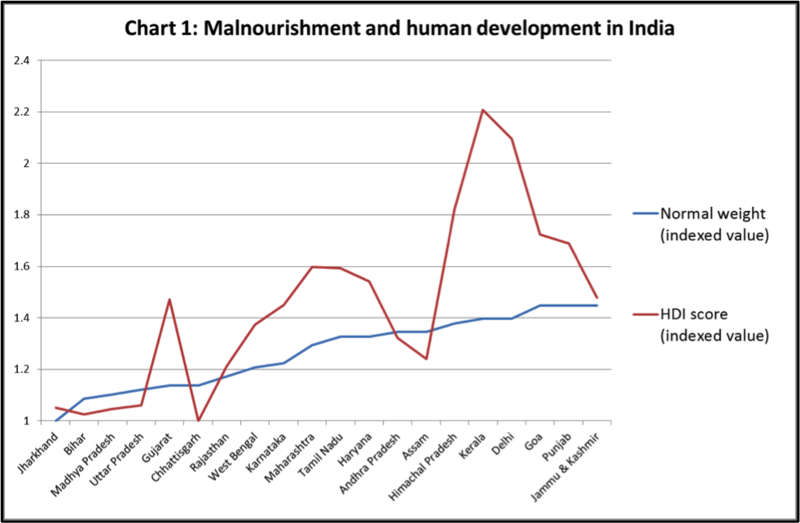 Chart 1 compares the indexed values of nutrition levels and human development. Values for Indian states in both metrics are indexed to the lowest value; for “normal weight” (children) the lowest is Jharkhand, and for HDI the lowest is Chhattisgarh. The nine states without HDI scores are excluded. In general, variations in HDI are wider across Indian states than are variations in nutrition. Notable is the broad gap in HDI between Kerala and Assam relative to the states’ similarity in nutrition. This implies that Assam devotes more effort to nutrition per HDI “point,” while Kerala has room for improvement in nutrition given its otherwise high HDI score. The latter can be said also for Tamil Nadu, Maharashtra, and Gujarat. A regression analysis of health indicators in India’s Rapid Survey on Children (RSOC) reveals two factors having a statistically significant association with the Indian government’s HDI scores: prevalence of open defecation and coverage of injections (collectively measured for diphtheria, whooping cough, and tetanus). Gujarat’s 38 percent open defecation ranks in the bottom third of India’s states. Gujarat’s 62.4 percent coverage for injections is higher than that of only five states and more than 12 percentage points lower than India overall. These are not numbers one expects from a wealthy coastal province, especially one regarded as an example of India’s overall progress. Environmental pathologies such as air and water pollution threaten India’s public health, and food security is a looming concern. A widening wealth gap provides little hope that the poor, already vulnerable to the above, can survive India’s coming era of hyper-urbanization, rapid industrialization, and population growth. Leaders must not lay health challenges at the feet of culture, but confront them with sober regard for facts and with realistic, actionable policy solutions. A serious national dialogue would be a good start.